Why is it so important to keep those restrooms sparkling clean? Your janitorial staff really are heroes when it comes to keeping folks in your office healthy, but they can’t do it without the right tools at hand. From the sinks and counters, to the floors, urinals, toilets and the air itself, safe, anti-microbial cleaners are essential to preventing germ proliferation on all of these surfaces. We can help with revolutionary cleaning supplies and our regular mop replacement service that prevents surface re-contamination with old mop heads. If you read our previous blog on how hand washing can be a literal life saver, you know how essential keeping the restroom soap dispensers in good working order is! Part of keeping your restroom sparkling clean is making sure employees, clients and guests never encounter an empty soap dispenser in the lavatory. Not only can Loyal help with its regular dispenser and soap service, but our soaps are gentle and especially formulated to get hands squeaky clean without increasing antibiotic resistance that the CDC is warning against. Any company that has had a bout of flu fly through the office knows this first hand. Sick employees have to stay home and can’t be productive. The employees are out sick, the less productive the business. But keeping the restrooms clean, the soap dispensers filled and the hand sanitizing stations regularly spaced throughout the office can help keep employees from catching the nasties and spreading them through the office. Restroom cleanliness is an important aspect of this fight against infection. It’s also important to regularly train employees on how to prevent the spread of illness in the workplace. Reliable, fair prices, courteous, good products.! Just imagine you have an important meeting with a potential client. But when nature calls them to the restroom, they encounter slippery floors, empty soap dispensers, no paper towels, sloppy sinks and disgusting toilets! This will not leave a good impression. It’s a sign of poor customer service and can be a huge turn-off! A sparkling clean restroom, however, tells clients that you care about the details and their health. 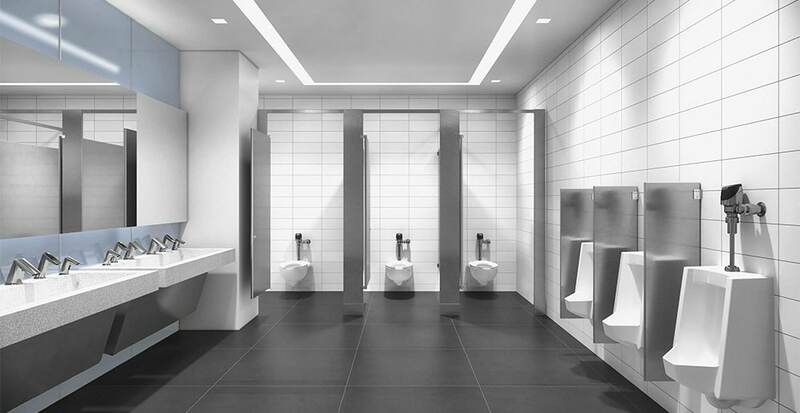 Do not overlook the importance of a clean restroom on your in-store/in-office/in-person marketing efforts! In an environment where so many things can impact your company’s healthcare costs, it really pays to do everything you can to promote good health at the office. Getting employees into fitness and good nutrition habits, smoking cessation and other health and wellness promotion efforts can really help. But so can keeping your restrooms clean. Simple infection control measures like this reduce the number of doctor visits and sick days, which can really make dealing with your insurance broker a lot less stressful. Speaking of doctor visits, a clean, dry restroom floor is one frequently-overlooked place where you can decrease workplace hazards. Slip and fall dangers can put people in the hospital and lead to worker’s compensation and other liability claims. Loyal’s workplace hygiene services include a regular restroom floor mat service that drastically reduces these hazards. Not only that, but our specially-manufactured restroom mats actually keep microbial contamination from spreading on floors! If you combine all of the benefits listed above, you can see just how a sparkling clean restroom can save you, your employees, your guests, your customers, etc. a lot of trouble and irritation. It can make their restroom experience more pleasant and a lot safer too. Regular restroom cleaning and maintenance can also reduce wear and tear on floors, walls, countertops, pipes and fixtures, saving you even more time and money in the long run.